COMMENT: IS DIVORCE JEWELLERY ‘A THING’? The home of rare jewels. A true cabinet of curiosities. Mysterious. Extraordinary. And so go the countless ways to describe Lydia Courteille’s Parisian shop and studio, not to mention her jewellery. A collector of vintage jewellery of all shapes and forms, a geologists, scientist, Lydia Courteille only began making jewellery a decade ago, but already she had established herself among some of the world’s most innovative and daring jewellery designers. Each of her pieces makes fantasy a reality, whether surrealist artworks brought to life in gold and enamel, a rockpool of opal glinting on the finger or a bracelet of pink rabbits that evoke an Alice in Wonderland dream. We spoke with Lydia as she launches a brand new website and her latest Amazonia and Homage to Surrealism collections. 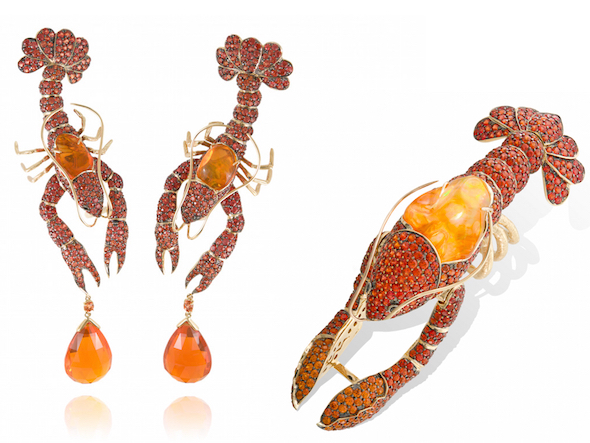 Adorn Jewellery Blog: The world of Lydia Courteille is truly fascinating and your work continues to challenge the boundaries of jewellery design. When or where did you begin? Lydia Courteille: I started life in the antiques jewellery business and then a few years ago I decided to create some pieces of my own. Success came quickly, so now, slowly but surely, I’m giving up antiques for my creations. I sketched my first designs in 1985, though I never learned design – it’s natural for me. I prefer drawing [my jewels], otherwise you can’t say you are a ‘designer’ – many people make the confusion between being a ‘brand’ and a designer. AJB: Tell us about Homage to Surrealism. You celebrate some famous artworks and artists with this collection. Did you have to study a lot of their work, and if so, who or what was most fascinating? LC: My favourite surrealists painters were Dali, Max Ernst and Magritte. I spend a lot of time in museums all around the world – it’s my little pleasure – so for me it was normal to imagine a collection. The surrealists are a great source of inspiration but I realised that the young generation don’t know them, especially out of Europe, so jewellery is another way to teach their stories. AJB: Although you are working less with antique jewellery, do vintage designs or jewellery from the past influence or inspire you? LC: I have bought 7,000 pieces of jewellery during my life in the antiques business; you imagine all of the techniques, designs, and methods [used]. It’s been a mine of inspiration for me! AJB: Nature, colour and lush tropical hues are part of your recent collections – can you give us an insight into your next collections or current designs you are working on?